Although often attributed to a certain 'Nennius', the 'Historia Britonum' ('British History') is not the work of a single author but a compilation which grew by accretion--one series of legends after another added to the original core--and was repeatedly rewritten over several centuries. Modelled after Irish chronologies and containing much fabled material, it offered the only history of Wales in early medieval times. It was attributed to both Nennius and Gildas to give it intellectual authority. Geoffrey of Monmouth drew upon it for his 'History of the British Kings' because it preserved ancient stories and legends of the British. Also, it contains the earliest mention of the name Arthur in its stories of an early British king. 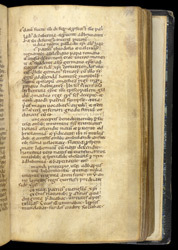 This manuscript is the most complete copy. This page comes from a section on the life of St Patrick, a Christian Briton taken to pagan Ireland as a slave, to work as a swineherd. Patrick returned to Britain and embarked upon an intensive program of Bible study. The first full paragraph tells of Patrick's being sent to convert the Irish.